One way to trace the history of an organization is through the people who worked for it. Recently, I’ve been working on a project to write biographies of some key figures in the history of WCS and upload these to Wikipedia. This has the advantage of not only providing a historical resource about the person but also broadening awareness of WCS’s history. One of the new entries added to Wikipedia. Archives, libraries, and cultural institutions have begun to utilize Wikipedia more extensively (sometimes in mass Wiki edit-a-thons). They use Wikipedia to add accurate historical content or to improve current content. At the same time, they also use Wikipedia to raise awareness of their archival collections by adding links within relevant entries to direct users to their archives catalog. A second part of this project will be to add links in the Wikipedia articles that exist for people who worked for or were associated with WCS and for whom we have a finding aid for a collection created by them. Example of a link to the WCS finding aids from the William Hornaday Wikipedia entry. There is already a good presence in Wikipedia of some historical figures linked with WCS–for instance, William Temple Hornaday, first director of the Bronx Zoo, William Beebe, Bird Curator and Director of the Department of Tropical Research, and Henry Fairfield Osborn, Jr., President of the Society for 29 years. However, there was a marked gap in the histories of some of the curators and scientists, who, over the course of their careers, made positive and lasting impacts on the organization–people who were quite ordinary but who over time developed remarkable careers and contributed profoundly to WCS and its development. So far, I have written about four hugely delightful and incredibly interesting individuals who have all made an impact on the organization; they are Lee Saunders Crandall, James Arthur Oliver, John Tee-Van, and Jocelyn Crane. Lee Crandall: Born in 1887, Crandall began working at the Bronx Zoo at the age of 21, in 1908, as a student. He became Curator of the Bird Department in 1919, before rising to General Curator in 1943, a post he held until his retirement in 1952. His contribution came in the field of zoological management. He came to be one of the foremost and respected authorities on zoological park management and the maintenance of wild animals in captivity. His 1964 publication The Management of Wild Animals in Captivity was the culmination of 50 years of observation on the feeding, housing, reproduction, and longevity of the animals at the Bronx Zoo, with references also drawn from zoos around the world, and he quite rightfully became known as the dean of American zoo men. John Tee-Van: Tee-Van was an impressive scientist and administrator. He spent his working life with WCS, beginning at just 14 as an apprentice zookeeper at the Bronx Zoo in 1911. In 1917 he became a field assistant to WIlliam Beebe in the Department of Tropical Research, contributing to the Department as a scientific assistant and a practical organizer. His work with the Department of Tropical Research meant he did not return to the Zoo until 1940, whereupon he settled as Executive Secretary and Administrative Assistant to the Director. It was not long, however, before Tee-Van himself became Director of the Bronx Zoo in 1952 and General Director of the both the Bronx Zoo and the New York Aquarium in 1956. 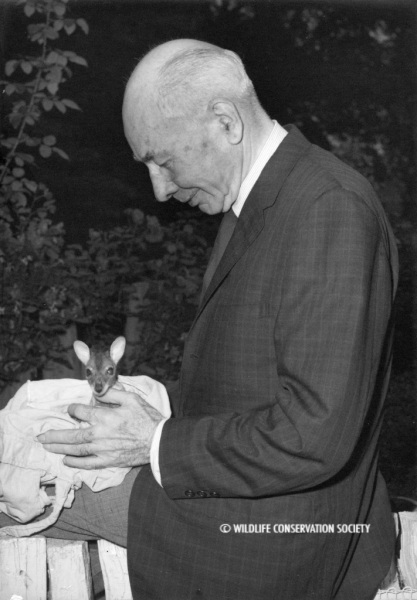 Aside from his extensive contributions to the scientific work of the Zoo and the Society, Tee-Van was instrumental in looking out for the welfare of the employees. He was responsible for gaining Social Security, hospitalization insurance, and group life insurance for WCS employees, and he also founded the staff publication Zoo-Log. Tee-Van served the Society for 50 years, 10 months and 13 days. Jocelyn Crane: Crane came to NYZS after completing her zoology degree in 1930. 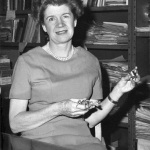 She became a laboratory assistant in WIlliam Beebe’s Department of Tropical Research, rising to Research Zoologist and, finally, Director of the Department upon Beebe’s death in 1962. She worked tirelessly for the Department, becoming an expert in ethology, writing scientific papers and reports, as well as fulfilling administrative duties. Her greatest contribution came with her study of the fiddler crab–researching their morphology, systematics, biogeography, and behavior. 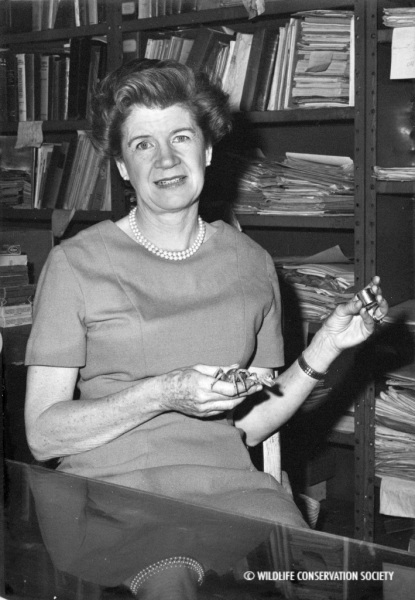 She studied the crab throughout her entire career and published her seminal work, Fiddler Crabs of the World, in 1975. James Oliver: Unlike the previous three, Oliver did not spend his entire career with WCS. He began as an educator at the Northern Michigan College of Education before moving to New York in 1942 to became a member of the Herpetology Department at the American Museum of Natural History (AMNH). He came to the Zoo in 1951 and served as the Curator of Reptiles for seven years before becoming Director of the Bronx Zoo in 1958. Oliver’s greatest achievement was overseeing the reconstruction of the Zoo’s Reptile House. He designed glass-fronted exhibits and created an environment that displayed reptiles and amphibians in surroundings that closely as possible simulated nature. Oliver went on to be the only person to ever have held directorships at the Bronx Zoo, AMNH, and the New York Aquarium. We’ll keep you posted as we continue to add more biographies to Wikipedia and work to increase access to the WCS Archives. This post was written by Caroline Catchpole, who has spent the past several months volunteering with the WCS Archives and working with the WCS Photo Collection. Caroline is an Archivist, having gained her qualification at University College London. She is particularly interested in increasing accessibility to archives and utilizing technology to achieve this. See also WCS’s Photo Blog, Wild View, for more from Caroline on John Tee-Van.